Acosmeryx purus Kudo, Nakao & Kitching, 2014, Tinea 23(1): 35. Type locality: China, west Yunnan, Changning County, Songzishanding, 2500m, July 2007. 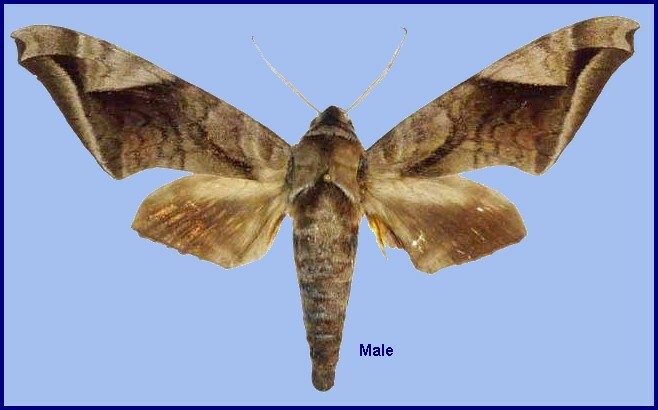 Wingspan 94 mm, forewing length 45 mm (male). Forewing rather more slender and apically sharply pointed than Acosmeryx naga (Moore, ) from Taiwan; fine transverse lines on the upperside more obscure, giving a more uniform overall appearance; dark brown discal band that extends from the costa towards the centre of the outer margin more sharply defined anteriorly and straighter than in Acosmeryx naga; triangular area anterior to transverse dark band paler grey than in Acosmeryx naga; grey submarginal band paler and straighter from vein Rs4 to the tip of 1A; dark brown submarginal area on forewing underside more weakly concave on vein M2 than in Acosmeryx naga. In the male genitalia, harpe similar to Acosmeryx naga, but more slender. Phallus shorter and thicker than in Acosmeryx naga; apical 'bird-beak'-like transverse process sharper, with a more slender neck than in Acosmeryx naga. Vesica with shorter and thicker section basal to the lateral diverticulum, which is also shorter, thicker and apically more rounded than in Acosmeryx naga. The female is not yet known (Kudo, Nakao & Kitching, 2014). The new species is close to Acosmeryx naga but can be distinguished by the more uniform pattern of the forewing upperside and the more weakly concave submarginal zone on the forewing underside (Kudo, Nakao & Kitching, 2014). The holotype was captured at a high elevation, suggesting that Acosmeryx purus may be a higher montane species. Although the label data of the paratypes gives an altitude of 1600m, data on the labels of specimens of other species from the same location give altitudes of 1800m and 2100m, so there may be some doubt as to the exact altitude at which the paratypes were actually caught. They may be from a higher elevation than the labels suggest (Kudo, Nakao & Kitching, 2014). China: vii (Yunnan); viii (Guangxi). China: Chongqing (Simianshan); Yunnan (Changning County, Songzishanding, 2500m); Guangxi (Longsheng County, Mao'er Shan, 1600m).